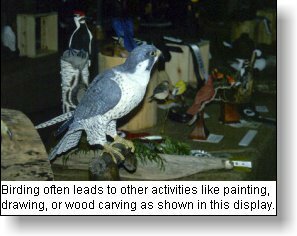 Bird watching or �Birding" as it is called by feathery aficionados has been listed as the fastest growing outdoor activity by many sources including Canadian outdoor leisure surveys. It is an outdoor pursuit that is shared by young and old, families and clubs, wildlife scientists and those who are simply outdoors on a walk or an adventurous hike. It can be a simple experience or a complex activity depending upon the wishes of the individual. It requires few special tools to enjoy ( a bird guide book and comfortable clothes) yet, it can be expanded with extensive investments in items like cameras, binoculars or spotting scopes, and, libraries. Birding is also a fast growing activity on the internet with numerous national, world wide and regional sites. British Columbia has a number of sites and more seem inevitable. There are also numerous technical and informational sites devoted to bird species and programs like those sponsored by the Cornell Laboratory of Ornithology, the most comprehensive North American bird study university. Bird watching requires few tools for the beginner. Two items stand out in my experience as the most important. The first is a good bird watching guide book, easy to read and with good color definition. There is no doubt that Roger Tory Peterson's field guides fill this need. They are pocket sized and have clear and accurate colors for all species. Should you live in British Columbia, as I do, I would recommend that you purchase a copy of the Peterson Field Guide titled, "A Field Guide to Western Birds". 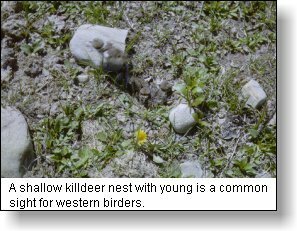 It shows all common and often uncommon bird species found in North America west of the 100th meridian. Color drawings are shown of all species including, in some cases, adult and juvenile stages of maturity. A new feature in the third edition are range maps of all species which show the general outline of the range of each species including breeding and wintering zones. The second most important item for the bird watcher is a good set of binoculars. My favoured set are those with 10x power and a wide viewing field. I have numerous sets of binoculars including those new ones that have instant focus for the viewer. Many companies produce binoculars but, it has been my experience that binoculars are like a good hat or a good pair of shoes. The user must find a set that is comfortable for their eyes and that give them a sharp and clear image. Naturally the more expensive binoculars have better lenses and hence will provide those sharper image. I would recommend that when you are going to buy, insist that you be able to take the binoculars outside where you can look with natural not artificial light. As well, watch a moving object like a plane, car, or flying bird and see how easy it is to maintain focus and clarity. Also. compare wide angle lens binoculars with narrow lenses. Only when you are satisfied that the set you hold fits like a good hat do you buy. Once you are equipped with these two key items, then you are ready for a most fascinating outdoor experience. I would recommend that you start a life list early. A life list is a formal list of birds that you have seen and identified. You will be surprised at how quickly this life list becomes a phobia. Some active birders actually and actively pursue their �life list' in all their travels, even �to the ends of the earth', as it has been said. I am still missing four provincial birds actually seen in their province; the snowy owl, the blue jay, the Atlantic puffin and the gyrfalcon, but, I hope to soon complete my own special Canadian Bird List. 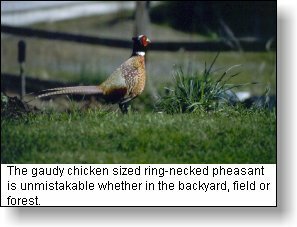 Bird identification is without question easiest in the winter and spring when bird are in their full adult plumage. In the summer and autumn, immature birds with their various colors and adult feather molting often makes it difficult to determine some species. 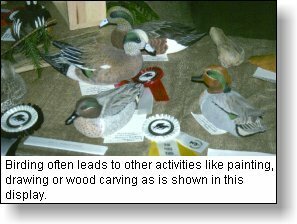 As well, some birds take up to four years to develop full adult plumage and these immature birds may look like other species. Be prepared when identifying that you are in fact looking at the species you have chosen. Guide books often provide additional tips to help. 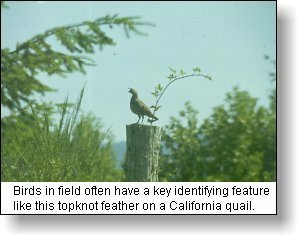 All birds have a basic shape and size that will assist in your identifying. As an example song birds have silhouette shapes that are the size of a sparrow, the size of a robin, or, the size of a crow. Another easy identifying feature lies with the actual parts of the bird such as; the size and color of the tail and the outer tail feathers; the colors on the breast and the belly; and, colors on the chin, throat, forehead and crown of the head. Look at these key locations with your binoculars to ensure that you have the correct identity. Bird watching is a life long hobby that can become a part of your everyday outdoor excursions whether they be walking or traveling. 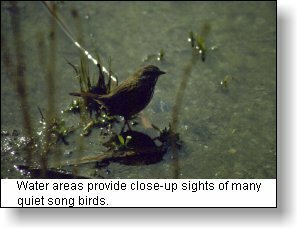 Some locations such as marshes and estuaries have many visible birds and they are a good place to start birding for the beginner. Once you have clearly identified that first bird you will be hooked to a lifelong activity which will provide uncountable hours of pleasure. After some successful birding experience you will then find yourself searching to identify the various calls and songs that are such a common occurrence in our Canadian outdoors and, backyards.